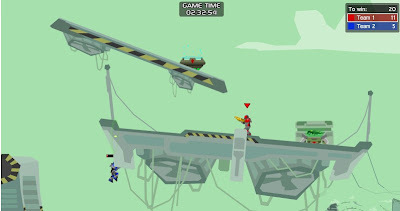 Armor Mayhem is another action platformer shooter game on armorgames. In the game, humanity is at a turning point i.e. energy has been depleted and they journey into a neighboring planet to find an infinite source of energy - crystals that looks very much like kryptonite and tiberium. The game features a huge variety of weapons and maps to unlock as you progress in it. Also graphics and animation are quite neat - you'll surely enjoy the gameplay. Controls are easy to get the hang of plus you can configure them in the main menu to redefine the jump, action, adrenaline button and others. Meanwhile, here is AM Armor Mayhem walkthrough for some random level of the game and watch out for the cheats.